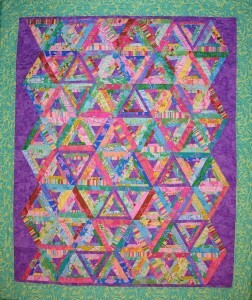 Gumbo Design Studios specializes in quilt patterns, presentations and workshops and custom projects. With more than 25 years’ experience in designing and crafting fiber art projects with a Louisiana French Creole heritage, Deborah incorporates vivid color, print textures and contemporary interpretations to her work. Using commercial fabrics,she finds it’s like making a rich gumbo,where the elements work together to create a unique and striking result. 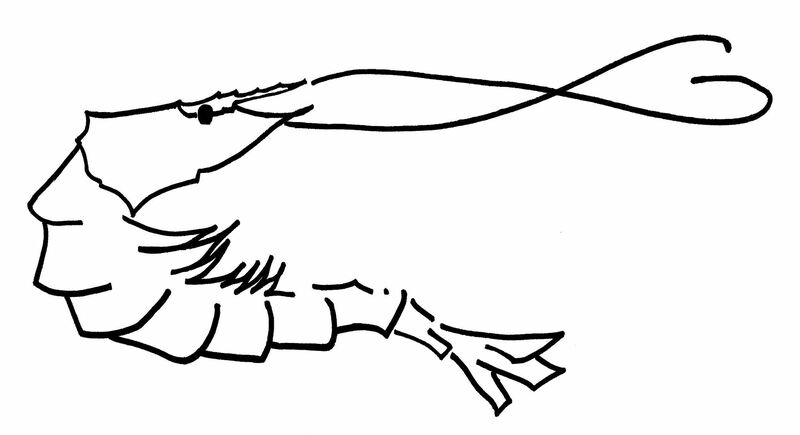 Every pattern includes some lagniappe (lan-yap),a little something extra. 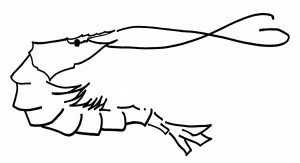 Common in the New Orleans culture,lagniappe is like a “baker’s dozen”. It’s a gift to my customers to share my love for quilting and my home town. My art quilt “Life’s Buttons” has been accepted into the 2017 juried,national Sacred Threads exhibit to be held at Floris United Methodist Church in Herndon, VA, July 7 –23. Covered in meaningful buttons and other memorabilia from my grandmothers’, mother’s and my garments, this quilt was both a happy and sad project. It reminded me of my loss,but also brought to mind the guidance all these women gave me in becoming a strong, resourceful and creative person. Qualities I hope I am sharing with my own granddaughters. This was an outstanding quilt show! My quilt was front and center on the stairwell landing. 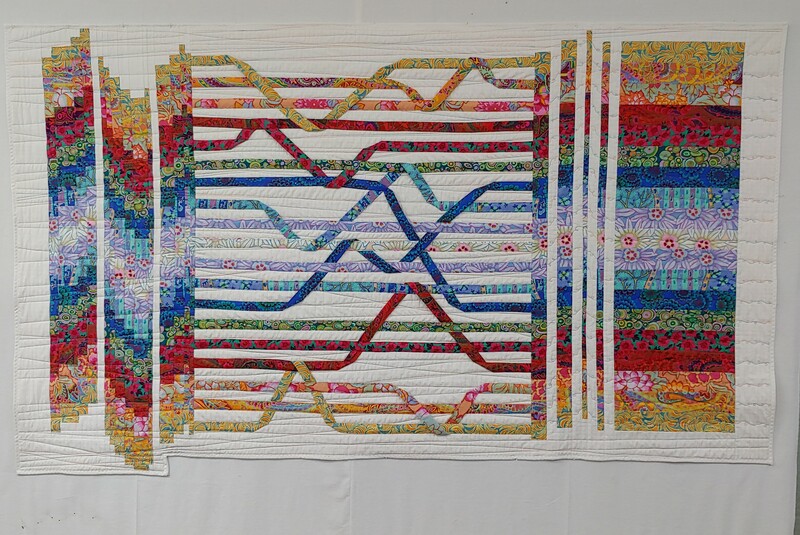 This biennial invitational quilt exhibit showcases work from local artists. Curated by master quilter Linda Fiedler and artist Berry Blessin. This year’s theme was Trends. 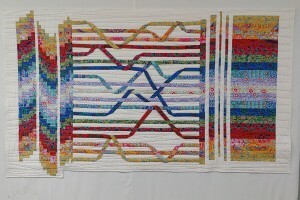 My quilt was placed on the entry staircase on a blue wall,which really popped the colors and white background. It’s a strong graphic piece using matchstick quilting. 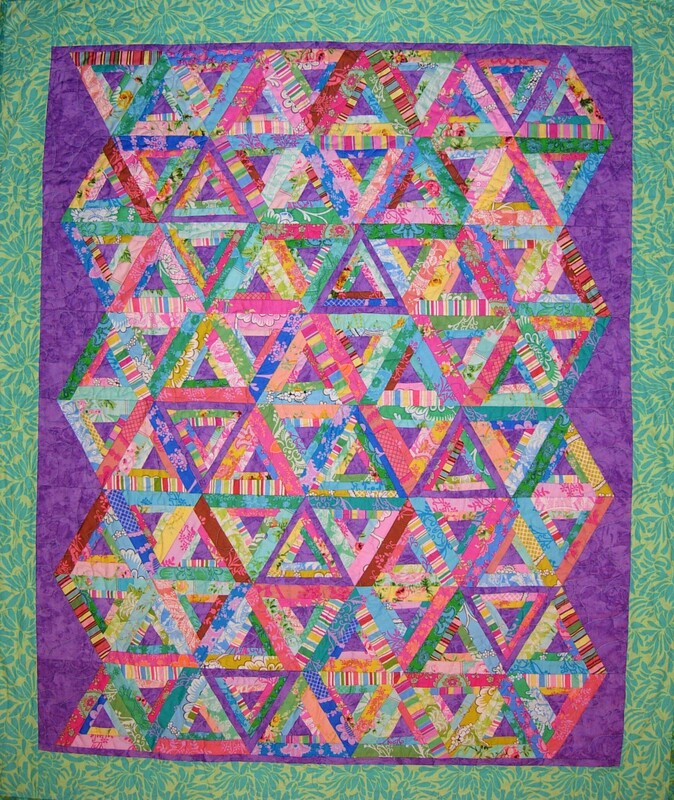 The central section was quilted,then padded strips were added on top,twisted and stitched down in position. It was made in three sections,then joined together. The Piedmont Center for the Arts offers gallery displays of all types of art,classes,outreach programs in the community. I have several art abstract quilts for sale at the Glassworks Gallery in Sperryville,VA. along with quilted eyeglass cases and bowl cozies. Lots of other hand crafted art is available including hand blown glass items from a long list of local artists.